Can you imagine anywhere outside of the craft brewing world where the word “dank” means good rather than rank? Officially, the word dank means something that is damp, musty and chilling. For example, I can’t say for certain because I don’t have time to look it up at this moment, but I would be willing to bet folding money that the word “dank” appears in Edgar Allan Poe’s short story about the live entombment of a foe, “The Cask of Amontillado.” Or, if not there specifically, surely it is a word wielded by Poe at some point to cause a chilling effect in the reader. Dank in the rest of the world is something nasty, but in the world of craft brewing (and, I’ve been told, in the world of marijuana connoisseurs), dank is a good thing. It promises potency, and even something exotic, something beyond the pale. So, if you understand the lingo, when you see a four-pack of Dank Wood from the always reliable Founders Brewing Co. of Grand Rapids, Mich., it’s the promise of something extraordinary. Dank Wood is an imperial red IPA aged in bourbon barrels and weighing in at a well-muscled 12.2 percent! It pours with a lively head, which is something I like to see in an ale that’s been pumped up to this level. Right off there is a thin band of woodiness that settles on the tongue like a mild caning in a despotic Pacific rim country (guess which sitting American president would not get that reference). That’s the barrel aging. Gives the beer wood, and makes me wonder how this imperial red IPA would taste without the wood, because, sometimes, it feels like I’ve been sucking on a green twig, there’s that much woodiness. It’s almost astringent in its woodiness. 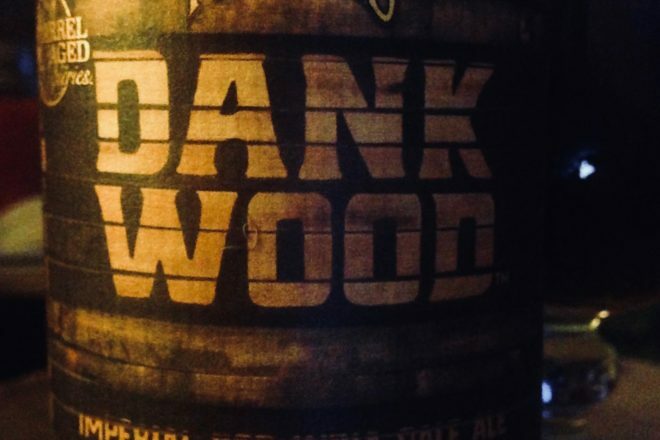 Dank Wood was released last April, the third in Founders barrel-aged series of big beers. After the woody walloping, lovely caramel notes are released, remnants of the red ale beneath all of this. I found myself searching for those sweet underlying notes with each sip, and then going into ecstatic spinal shivers upon finding them. Many, many things going on in this big bruiser. The flavor reminds me of a seasonal West Coast IPA from one of the pioneer breweries (one that was threatened by wildfires in November), although Dank Wood is almost twice as strong as Celebration Ale (whoops, I wasn’t going to name that beer). As an admirer of words and beer, I will say that dank is entirely appropriate in these circumstances, and you really can’t go wrong with this particular dankiness.